A lot of drummers think that buying the best headphones for electronic drums means spending a fortune on some premium pair from a top-rated headphone manufacturer. Others seem content with just about anything as long as it doesn’t squeeze their heads after wearing them over an hour. Truth be told, shopping for headphones requires some understanding of what makes them tick and what gives them sound clarity, comfort, durability, and versatility. Not all headphones are made to go hand in hand with electronic drums, and not all headphones for electronic drum kits actually do what they’re supposed to do. I should know, as I’ve been around the block a few times with what it takes to put up a recording studio. 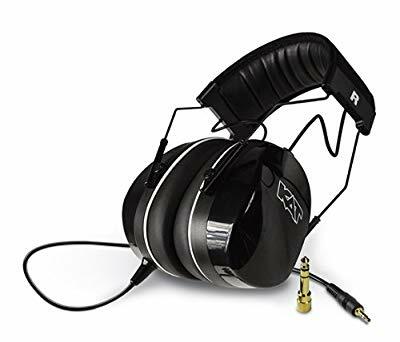 If you don’t want to waste time or money on something you don’t need, check out these top headphones that are suitable for electronic drum kits. The MDR7506 headphones have been around for over two decades. As far as durability goes, these certainly are in a league of their own. The ear pads don’t share the same design quality as the build itself, but they are cheap and easy to replace. The impedance is in the medium to high range at 63 ohm. The drivers are 40mm which is a bit smaller than more modern headphones designed for electronic drums. However, the quality of the sound has stood the test of time and that’s more than I needed to see in this price range. 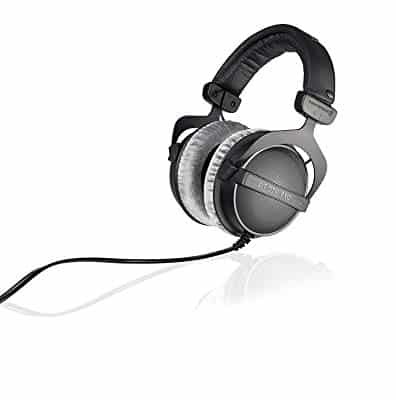 The MDR7506 headphones have a closed back design which should block out a large amount of outside noise. The cable is coiled and it is just short of 10 feet long. While it is not detachable, it does give a drummer plenty of freedom around the studio. The jack is a standard 3.5mm but it also has a screw-on 6.3mm plug which will let you use the headphones in any amateur or professional setup. 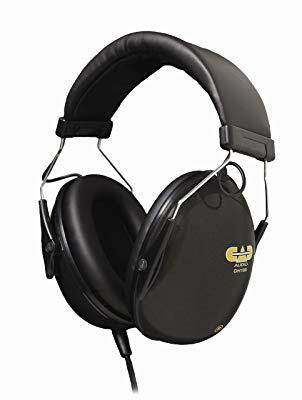 Considering the modest pressure generated by the headband and the thick padding around the racetrack ear pads, you’ll be hard-pressed to find a more comfortable pair of headphones to pair with your electronic drum kit. At least not in this price range. 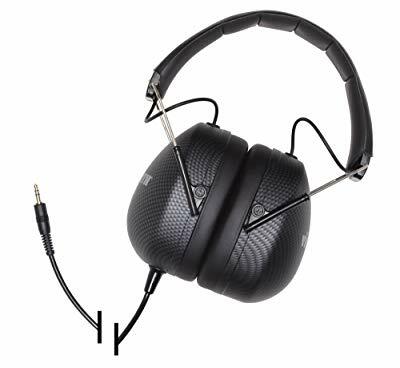 At first glance, the RH-300V headphones look like a pair of professional headphones for electronic drum sets. Roland is a well-known manufacturer of audio equipment and you can see why the V-Drums RH-300V is loaded with high-end features. The closed back design is a given, as you’ll want to block out most external noise lest it interferes with the audio. The Headphones are also foldable which gives them a good portability rating. You can easily carry them between your home and your studio. The cord is just 2.5 meters long but it does have a standard 3.5mm jack and a 6.3mm adapter for all your gear. The drivers are standard 50mm and the rated frequency response is 10Hz to 22kHz, which are both beyond the human hearing range of 20Hz bottom and 20kHz top. What is a bit surprising is the low impedance rating of just 32 ohm. What it means is that you might need an external headphone amp to properly drive these to their full potential. You will get that punchy sound associated with electronic drums. The question is how much punch, depending on the quality of your headphone out – the output impedance should be much lower than 32 ohm. Given the sturdy construction and fine-polished ear cup plates, as well as the balanced frequency response, the RH-300Vs should definitely be on your radar if you’re shopping for an electronic drum setup. These are definitely one of the best headphones for drummers. If you’re a serious drummer and you haven’t heard of Vic Firth before, you should probably touch upon your percussion-related instruments history. This manufacturer can be associated with everything from headphones to pianos, so although it’s not a household name among amateurs it says nothing about the respect it has of professional musicians worldwide. 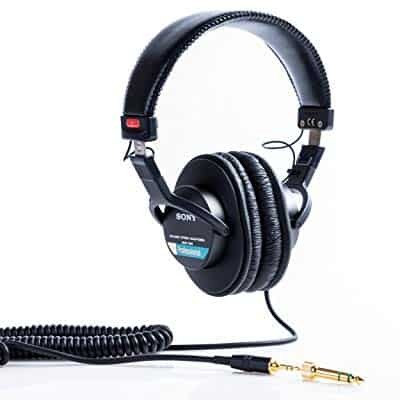 The SIH2 headphones happen to be among the cheapest options for an amateur studio setup. The headphones are designed for noise isolation and this redesigned model can reduce exterior noises by up to 25 decibels. You’ll notice that the ear cup design is a bit puffed up than what you’re used to seeing. This is more than enough to house the 50mm drivers, but its main goal is noise isolation – the cups are as big as some firearms ear protection. The rated frequency response is 20Hz to 20kHz. As previously mentioned, this is right at the human hearing range. The headband and the ear cups have thick padding which helps reduced the pressure of the extra weight. At 15.5oz, these headphones are not the lightest on the market but fortunately for you, this won’t make them any less comfortable. Beyerdynamic generally makes well-balanced audio equipment, whether you’re talking price, durability, or sound quality. This also holds true for their DT 770 Pro studio headphones, which in my opinion are a solid choice for electronic drum headphones. The coolest feature is that you get to choose between three different impedance ratings: 32, 80, and 250 ohm. Obviously the higher you go the more you’ll have to pay, but the best fit for our purposes is the 80 ohm version. The DT 770 Pro headphones are easy to drive so you won’t have to commit to purchasing additional sound enhancing gear. We all know buying amps is just as tiring as getting the right headphones, if not worse. The cable is not 3 meters or 10 feet – you should have enough wiggle room in most small studios. The frequency response is 5Hz to 35kHz. In reality though, this rated range is obtained in an anechoic chamber. But the ear cups won’t come close to covering your ears in anechoic chambers so you won’t actually get the full frequency response in real life, but that’s beyond human hearing range anyway. When it comes to comfort, the DT 770 Pros are pretty good. The extra padding on the headband and the ear pads are comfortable. However, you may not want to abuse adjusting the fit too often as the mechanism is not the most durable. Apart from this tiny drawback, the overall durability of the workmanship is quite impressive even by Beyerdynamic’s standards. As far as recording headphones are concerned, these are some of the most versatile. These headphones come with smaller 40mm drivers. Although they are not super loud, they do have surprising noise isolation potential. The only thing you might be missing is that signature punch. The KTUI26 is lightweight and durable despite not being built by a top brand. The large ear cushions have extra foam which makes the headphones easy on the ears. The headphones can reduce exterior noise up to 26 dB which is nothing short of impressive considering their modest price tag. The isolation is of course passive, but that might make them a lot more reliable during important recording sessions. The frequency response of 20Hz to 20kHz is pretty much standard, but the clarity is there despite the modest price. 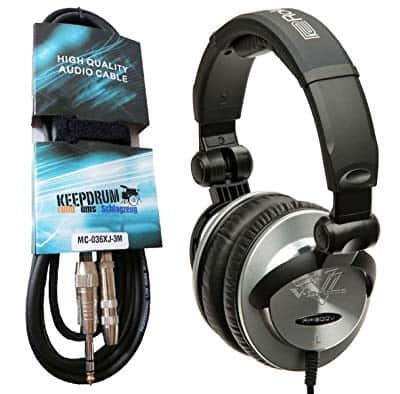 You should know that although the impedance is just 32 ohm and the low end is nothing to write home about, the KTUI26 headphones are still a good choice for electronic drums for the value alone. The weight is around 10 ounces which doesn’t mean much given all the extra padding. However, the short cable might also be somewhat limiting in some cases. That being said, you could always extend it to suit your needs. Unlike a lot of other headphones, the DRP100s are specifically designed for use with electronic drum kits. Now, does that automatically make them superior? – Let’s find out. Alesis knows their way to a drummer’s heart. Their line of pedals is evidence enough. However, despite the obvious quality noise isolation design, the output is not as impressive. You should know that it’s really simple to design headphones for noise isolation. Even school children can do it – just make the ear cups big and well-padded and cover your ears. The DRP100 headphones come with 40mm full-range drivers. We already know that this isn’t a lot for professional setups. On the other hand, when paired with a DAC amp, the headphones instantly get an upgrade way above their price range. On the low end the DRP100s won’t give you much without an amp – these low impedance headphones could use a dedicated amplifier. The DRP100s are as budget-friendly as electronic drum kit headphones get. However, since you’ll also need an amp to squeeze the most out of them, they’re only as affordable as you requirements allow them to be. CAD Audio is clearly not a household name when it comes to studio gear. 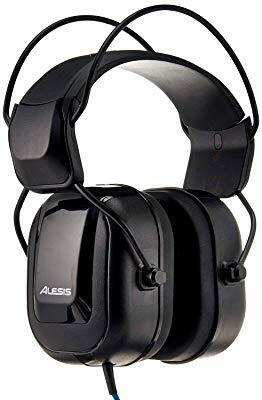 However, if you’re looking for a budget-friendly pair of headphones for your electronic drum kit setup, these just might do the trick. The noise isolation properties are not amazing at -19dB, which might be enough if you’re alone in the studio or at home. The 50mm drivers will give you a decent output with fair distribution across all frequencies. The ear cup design allows you to wear the DH100 headphones for hours at a time. The quality on the low end is also quite surprising in this price range. The frequency response should allow you to explore multiple musical genres. The quality of the construction is not amazing but decent enough for an amateur setup. The balanced sound should definitely offset some of the build’s drawbacks. Overall, these may not be the absolute best headphones for electronic drums, but they aren't a bad choice option either, especially for budget-conscious drummers. Whether you’re an amateur or a pro, there are two things to consider when comparing impedance ratings in headphones for electronic drums. The lower the impedance, the easier the headphones are to drive in general. Now, this also means that you might have to pay extra. It’s all about impedance matching. If your headphone output is very high, it can probably drive headphones of any input impedance rating. Saving money on the initial purchase and going for a pair of low impedance headphones might also mean that you’ll end up paying for separate amplification. The signal will always flow, but if there’s an impedance mismatch and you can’t drive your headphones properly, the extreme low and high frequencies will get rolled off. A lot of drummers prefer using in-ear monitors in the studio. 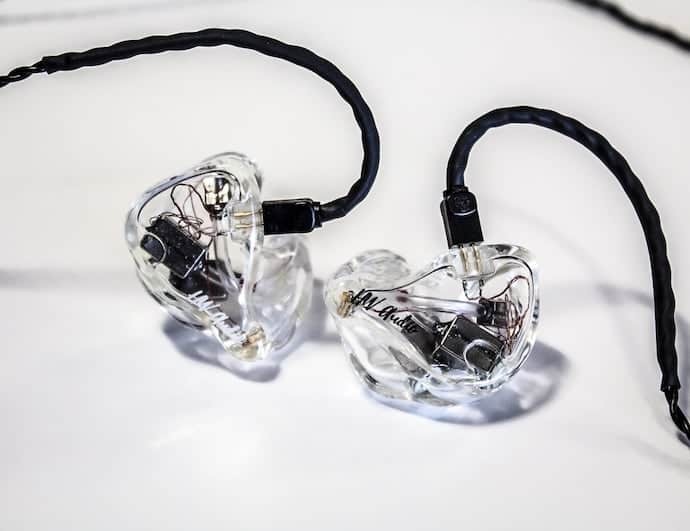 Since they’re obviously good for live gigs, it makes sense that the high quality sound and comfortable fit would be amplified in a studio setting. One reason to choose overhead headphones over monitors is obviously the price. On the other hand, you may also prefer the extra sound isolation that a pair of big ear pads offers. Depending on the quality of your recording environment, and depending on how many people you’re playing with, you may need more or less noise isolation. In this article, I’ve tried to help you find the best drumming headphones for you based on your unique needs. I've showcased my top choices among headphones for electronic drums based on a number of most significant factors. Not all drummers look at the same pair of headphones and think they’ve struck gold, and neither should you. To deliver your best performance, you need to find what fits your play-style and setup.